Looking for the best Betta fish tank? Known for their vivid colors and spectacular fins, Bettas deserve a quality home. However, there’s a lot of bad information available online, stating they can live in small bowls and tanks. *Spoiler Alert*–they can’t. You need an aquarium that’s able to support their needs. So, what kind of aquarium is that? 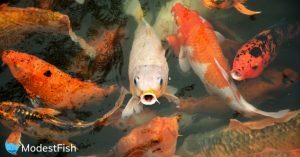 Luckily, I’ve looked into it quite a bit, and come up with some suggestions that will keep your Betta happy and healthy. 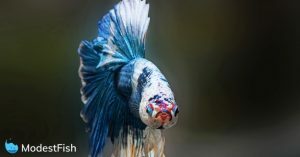 Final Thoughts: Which Betta Tank is Best? 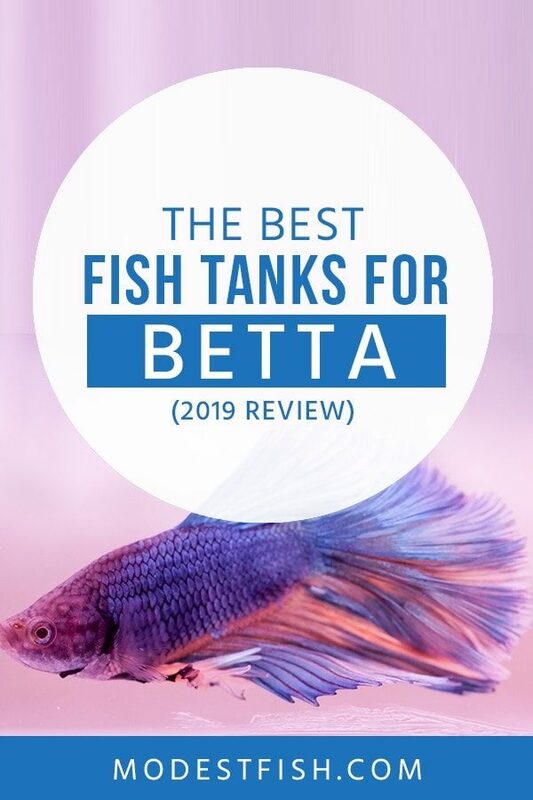 **Before reviewing the individual Betta fish tanks, I’d like to talk about how you can effectively choose one. Betta’s originate from Southeast Asia, inhabiting shallow streams and rice paddies. BUT, this does not mean you can keep them in tiny bowls or tanks. Your Betta tank should be no less than 5-gallons. Betta’s are remarkable fish and they deserve the best environment to be healthy and flourish. It’s true that Betta’s come from still waters, but you’ll still need to look for a tank with a filter. They’re key for maintaining your aquarium and keeping your Betta stress-free. You’ll want a gentle or adjustable filter as Betta’s struggle to survive in strong currents. Or, you can buy a separate filter. Betta’s are beautiful fish, so you’ll want to be able to actually see your Betta! Bright LED lighting is your best option. They’re energy efficient and really help to showcase your Betta’s spectacular colors. Betta’s need a regular pattern of day and night. Choosing a tank with day and moonlighting is a great way to ensure your fish stays healthy, and you’re able to view it at day and night. We both know how stylish Betta’s are, therefore, you want to do your fish justice by housing it in an equally spectacular tank. Having a tank with multiple unobstructed viewing angles will give you the best experience. It’s important to always put the health of your fish first. You shouldn’t opt for a tank because it looks ‘cool.’ You need to make sure your Betta will be able to thrive in the environment. 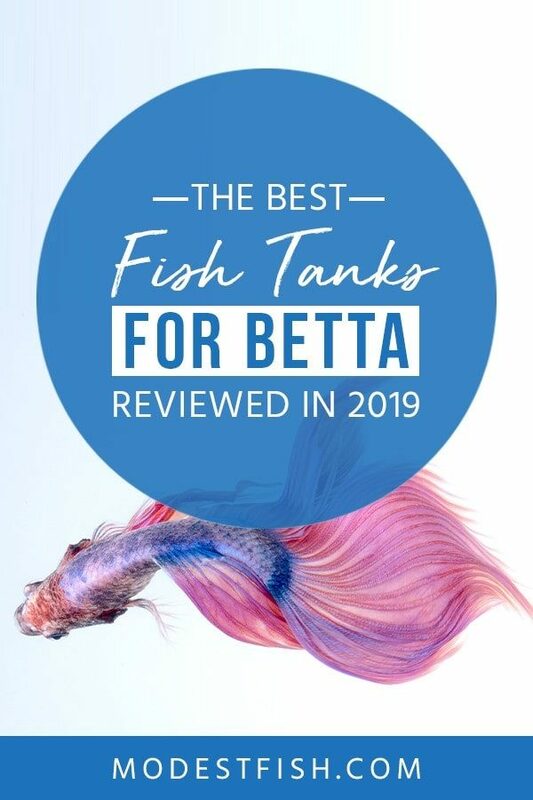 Let’s now check out the reviews for the best Betta fish tanks currently on the market. When it comes to aquatic architecture the Fluval Edge is in a league of it’s own. Coming in two sizes: 6 and 12 gallon, it features a unique 3D cube design with 360 degree views. The crystal clear glass tank sits inside a pedestal – creating the illusion that it’s suspended in mid-air. The kit includes white and blue LED bulbs. Which provide beautiful ‘daylight’ and ‘moonlight’ underwater effects. As well as an Edge filter with Cycleguard, Nutrafin Cycle and Aquaplus water treatments. The filter uses all 3 stages: mechanical, chemical, and biological which will provide your Betta with a clear and healthy water. Filters can take away the aesthetic qualities of your tank, but not with the Fluval Edge. It’s completely hidden from view, so it doesn’t compromise the beauty of this tank. Summary: When it comes to architecture, the Fluval Edge is in a league of it’s own. Featuring a 3D cube design, you get 360 degree views. When it comes to 5 gallon tanks for Betta’s, you may have a hard time finding a more suitable tank. Made from etched glass, you get a contemporary-looking aquarium that’s ideal for small areas. Such as desktops and counters. One end of the tank has a separate chamber for your pump and filtration system. There’s even extra space if you wanted to include a stick heater. The kit includes a hanging LED light system that’s bright! With its thirty-seven LED’s arching over the tank in an eye-catching light strip – covering almost the whole length of the tank. The 3-stage filtration system is quiet and effective, making the tank very easy to clean. It comes with all the necessary media: a porous foam block with a handle, activated carbon, and BioMax rings. The circulation pump can be too strong for Bettas. But, the output nozzle is adjustable, and turning it upwards can help. Additionally, purchasing a pre-filter sponge can also help to defuse and calm the water jet right down. Summary: Featuring an eye-catching LED light system, the tank is made from durable etched glass, it offers a contemporary look that’s ideal for desktops and counters. A fantastic and reliable fish tank, it’s a great kit for anyone wanting to get the best out of their Betta. The unique 16.8” tall portrait design features thick curved glass that looks great, and makes maintenance a breeze. A 3-stage Bio-Foam filter is tucked away and comes with adjustable flow settings. Allowing you to get the best flow for your Betta. Hinged LED lighting makes for easy access to the tank. Featuring a 3-way switch, you can toggle between white, blue, off, and blue-only settings. What’s cool, is the bright white lights create a shimmering effect – mimicking the underwater effect of sunlight. A horizontal sliding lid is a nice touch to tank. Making feeding and maintenance easy. Summary: The unique portrait design features curved glass to make it easy to install your Betta tank in tight spaces. 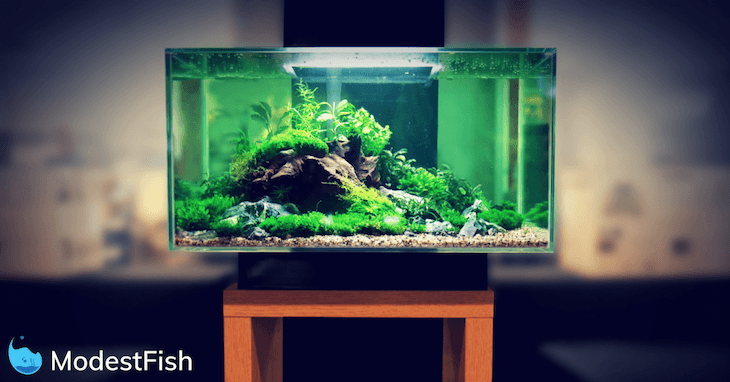 If you’re not a fan of glass aquariums, the Tetra Crescent Acrylic aquarium is a nice option. Measuring at 16.6 x 11.2 x 13.2 inches, it comes with a seamless curved front, black base frame, and clear cover. 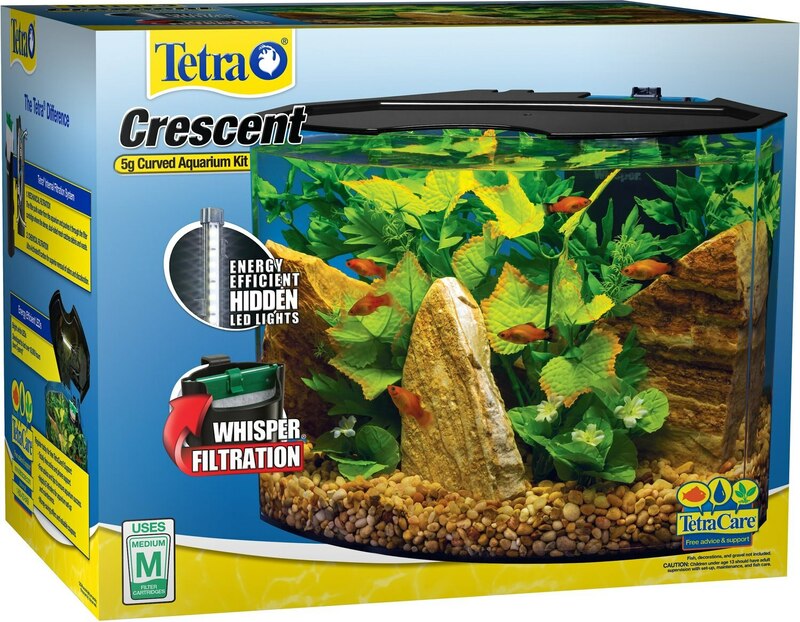 The best feature is the tank’s trademarked Tetra Whisper filter. An excellent filter, it uses a 3-stage filtration process and is fantastic at keeping your tank water clean. The Whisper filter does exactly what it’s name suggests – it hardly makes a sound! The kit includes ultra activated carbon, which does a great job at removing odors and discoloration. Hidden LED lighting illuminates your tank with its bright white lights. And the hinged plastic lid offers easy access to your tank for maintenance. However, there is an opening at the top. Your Betta would have to be very skilled to make the jump, but the risk is there. Summary: Featuring the famous Tetra Whisper filter, the tanks is made from acrylic and has a seamless curved front for unobstructed viewing angles. A wonderful pick for any novice looking to buy their first tank, and venture into the world of fish keeping. The kit includes all the equipment you’d need to get started. Including an aquarium care guide for beginners. It’ll teach you how to setup and maintain your tank, net, and food. You’ll get the AQUA Plus water conditioner and Cycle Biological supplement to make sure the water is a safe environment to keep your Betta healthy. The filter is powerful, quiet, doesn’t take up too much space, and does the job of keeping your tank clean. LED lights in the canopy are bright–producing natural daylight so you can illuminate your fish, plants, and decorations. Summary: A complete starter kit, the Marina LED aquarium is available in a range of sizes and includes everything you’d need to get started. So which is the best tank for your Betta? Well… they’re all suitable. Meaning none of them are below 5 gallons. Which we both is the lowest volume of tank you should consider purchasing. My opinion, I love the Fluval Edge. Yes, it’s on the pricer end of the scale, actually, it’s the most expensive. But, I’m sure you’ll agree that it looks awesome. However, if you’re not looking at the higher end of the scale, go with the Fluval Spec V.
It offers outstanding value for your money. The quiet filter’s a pleasure. You get extra space to include a heater and it comes with all the necessary media. Your main concern may be the strength of the pump, but you can counter this by adjusting the nozzle. Featuring an eye-catching LED light system, the tank is made from durable etched glass, it offers a contemporary look that's ideal for desktops and counters. Great list of tanks! It’s nice to see betta tank suggestions that the fish can actually be healthy and thrive in.